Since 1994, EA has released many games in this racing game franchise. Note: The era organization for these games was based on Wikipedia's once-used organization of the Need for Speed titles in the series' navbox template. They were based on the most common or significant aspects of installments in the particular eras. NFS game before they overhauled the series' identity. The Need for Speed logo for this era used a big, thick, metallic typeface. 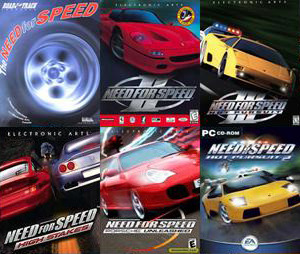 This era's games were later rereleased together in a 2003 PC-only compilation package called The Need for Speed Collection, save for the first game of course. Road & Track Presents: The Need for Speed (1994): The first game contained point-to-point open road tracks and several closed racetracks. The open roads featured AI traffic and police cars that chased the player. It was originally released on the 3DO console, but when the 3DO flopped it was later ported to DOS PC in 1995 and the PlayStation and Sega Saturn in 1996. The PC version of the game, Need for Speed SE (the "SE" meaning Special Edition), added a few new cars and tracks as well. Developed by Pioneer Productions on the 3DO, DOS, and Saturn versions and by EA Canada on the PS1, the latter of whom would develop all of the ensuing games until the Motor City Online spinoff. Nissan Presents Over Drivin' GT-R (1996) and Over Drivin' Skyline Memorial (1997): A Japan-only release for Sega Saturn and PlayStation respectively that was really The Need for Speed with only Nissan vehicles. Need for Speed II (1997): Released for PlayStation and Microsoft Windows, II expanded on the car selection of the original with several contemporary concept cars, like the Ford Indigo and Ford GT90. The McLaren F1, then the world's fastest production car and still the fastest naturally-aspirated car, made its first franchise appearance in this game. The game abandoned open road courses for arcade circuits. PC Gamer criticized many of the tracks' extravagant and unrealistic scenery, comparing many of them to being akin to driving on magic mushrooms. NFS II also had a special edition release for the PC, which added seven new cars, a new track, a "wild" driving style, and 3Dfx Glide support. 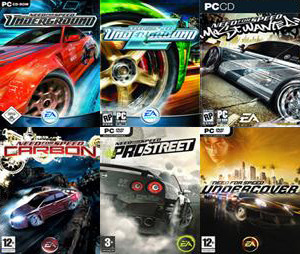 The PC version was also the first NFS developed by then-second series developer EA Seattle, which started a trend of EA Canada developing the PS1 versions and EA Seattle doing the PC versions. Need for Speed III: Hot Pursuit (1998): Released for PlayStation and Windows again, III reintroduced the police chases from the first game and improved the AI system, with each racer having different driving habits. The PC version provided the option to play as the police and catch speeders, while PS1 had unique secret tracks that could only be unlocked using cheat codes. Also, the PC version was the first NFS that was easily modded with add-on cars, as well as the first to have official Downloadable Content. * In the form of, what else, free add-on cars; the game did not support any more tracks beyond the nine standard tracks in-game due to hard limits (which also applied to the cars). You can still download them from EA's servers to this day! One of the highlights of the series, according to older fans and critics of the time. The Lamborghini Diablo SVnote "Super Veloce", literally "super fast" made its franchise (and arguably video game) debut in this game. Need for Speed: High Stakes/Road Challenge (1999): Released for PlayStation and Windows yet again, High Stakes was similar to III: Hot Pursuit, but with a career mode. This game's name referred to sudden death races where the winner wins the loser's car. This game is the first in the series to have damage models that affected the vehicles' appearance and performance. It was even the first NFS game to have visual modifications (before Underground made them popular). The PC version is basically a Mission-Pack Sequel to Hot Pursuit, because it also included all nine tracks from the previous game, while the PlayStation version didn't have those tracks. Road Challenge was the name of High Stakes in Europe and Brazil. Need for Speed: Porsche Unleashed/Porsche 2000/Porsche (2000): Consisted purely of Porsche road cars, from 1948 to 2000. Featured more realistic physics than previous games. Another shining moment from the series. The PC version is notable for being the last game in the series developed by EA Canada. Eden Studios made the PlayStation version (with this game being the last NFS on a fifth-generation platform), which has several differences compared to the PC version, especially tracks. Porsche Unleashed was titled Porsche 2000 in Europe and simply Porsche in Germany and Latin America. Need for Speed: Top Speed (2002): An additional online-only conversion of Porsche Unleashed that was released in response to both the release of an IMAX film called Top Speed and the Porsche Cayenne. It features three existing tracks from Porsche Unleashed and three Porsche vehicles: the 911 (996) Turbo, the 959 and the Cayenne Turbo. Access to this game was bundled with the PC version of Hot Pursuit 2. Need for Speed: Porsche Unleashed (Game Boy Advance, 2004): A portable version released four years after the original game, developed by Pocketeers, but not published by EA.note It was published by Destination Software in North America and Zoo Digital Publishing in Europe. Surprisingly for a third-party GBA game, it's 3D-rendered. Received much more mixed reviews than the originals, though only a few critics reviewed it. Need for Speed: Hot Pursuit 2 (2002): The sequel to the original Hot Pursuit, but with more and bigger tracks, more cars, and more race types. Hot Pursuit 2 was the last game in the series to focus on exotic cars for nearly a decade. Also, until a 2010 content download for Shift (see Cool Car on the main Video Game page) and later on Rivals, it was the last game in the series to have cars from Ferrari. Most of the other games up to this point, except for MCO and Porsche Unleashed, had at least one Ferrari. The PlayStation 2 version was also the first NFS game by EA Black Box, who would become the new main Need for Speed developer for the next several years, while all the other platforms' combined version was the last NFS game by EA Seattle. It should also be mentioned that Black Box's Hot Pursuit 2 for PS2 is a very different game compared to EA Seattle's Hot Pursuit 2. This game was also the first sixth-generation NFS game, and the only classic NFS game released on sixth-gen platforms. With EA Black Box taking control, the franchise focused more on the tuner car culture with a heavy focus on illegal street racing (save for ProStreet, which had organized race events), aftermarket customization, and cheesy storylines to boot. Police chases would not return until 2005's Most Wanted. Games in this era can be identified by the sleeker logo with the elongated tail in the letter S for Speed, except for Undercover which brought in a new typeface that's been continuously used since,note Although 2013's Rivals used a different typeface that evoked a bit of the older games' style, and the 2015 reboot has given the Undercover-introduced typeface a mostly minor update (the biggest difference being the N). as well a speedometer-styled "N" logo ◊ (which has seen varying degrees of usage and prominence since its introduction). In some regards, this era is what arcade racing game fans think of when NFS is mentioned, but some classic fans beg to differ. The first three games were also re-released in a Collector's Series bundle in 2006 for PlayStation 2 and Windows. Need for Speed: Underground (2003): Changed the format of the series from exotic cars on open road tracks to street racing with tuner cars. It introduced a storyline, car customization, drifting events, nitrous oxide systems, and (ignoring MCO) drag races. The game takes place in a fictional city called Olympic City. Underground was released for PlayStation 2, Xbox, GameCube, Windows, and Game Boy Advance (thus making this game the first portable NFS game). An arcade machine version of this game was also released in 2005. Need for Speed: Underground 2 (2004): Similar to the original Underground, but with a free-roaming city called Bayview. The game added a few new race modes, such as "Outrun" events in free roam where players have to beat another driver on the streets using any route they want by one thousand feet (three hundred meters), and "Street X", which were tight, nitrous-free, circuit-style races. Plus, new aftermarket parts including stereos and spinning rims were added to the game. Also for what it's worth, it's the first NFS title with playable SUVs, which had their own exclusive events in the game. Underground 2 was released for the same platforms as the previous game, along with a mobile phone version. A Nintendo DS version was released in 2005 with the ability to create custom decals using the system's touch screen. Need for Speed: Underground Rivals (2005): A version of Underground 2 for PlayStation Portable that's closer to the first Underground as it lacks an open world. Introduced muscle cars to the vehicle lineup. Need for Speed: Most Wanted (2005): Similar to Underground 2, featuring muscle cars and exotics in addition to tuner cars while focusing on the re-introduced staple of the series: the police chases. Due to being thematically a lot less flashy than the Underground games, the visual customization for the cars is limited, dropping the purely visual options like the neon lights. The iconic blue-and-silver BMW M3 GTR (E46) debuted in this game. The locale in this game is named Rockport, where the player tries to become #1 on the "Blacklist", the fifteen best racers in the city. Also released on the same platforms as Underground 2, the well-received game was also one of the Xbox 360's launch titles, which made it an early Killer App for the platform. The PlayStation 3 would later get the PS2 version of this game on the PlayStation Store in May 2012. To this day, several NFS fans point to this game as the series' highest point. Need for Speed: Most Wanted 5-1-0 (2005): A version made for PSP that also lacks an open world as well as a plot. Contains a mode called Tuner Takedown that allowed players to play as a police officer for one of the few times in this era. Need for Speed: Carbon (2006): A more story-driven street racing game, with the player recruiting drivers to their "crew". The highlight feature was the touge-inspired canyon races, which wound down narrow, twisting mountain roads, and the greatest danger was often driving off a cliff. Aftermarket customization also returned in full force with the "Autosculpt" feature, which allowed a greater degree of part customization. Takes place in a city called Palmont City. Carbon was released on all the same platforms as its predecessor, and was also the first Need for Speed game on PlayStation 3 and Wii, but the last on GameCube and the original Xbox. Interestingly, it's also the only game in series released on Mac (specifically OS X). Need for Speed Carbon: Own the City (2006): A portable version made for the PSP, Nintendo DS, and Game Boy Advance that takes place in a different locale called Coast City (which is really just Most Wanted's Rockport without the Camden Beach district and a few other changes) with a different storyline compared to the main game above. This was also the last GBA NFS game. Need for Speed: ProStreet (2007): Themed around organized race days with no illegal street racing. Switched to a more realistic handling model, and was so widely criticized for it that even EA admitted that this one was "not good" invoked. ProStreet was released on all the same platforms as the Carbon games except for the GameCube, Xbox, Game Boy Advance and Mac. Need for Speed: Undercover (2008): Returned to the Most Wanted model of focusing on illegal street racing, with a The Fast and the Furious-style storyline. The game takes place in a large locale called the Tri-City Bay. It was trashed by critics for its bad frame rate, its cheesy storyline, and for being not as good as Rockstar Games' Midnight Club: Los Angeles and EA's other arcade-style racing game from 2008, Burnout Paradise. Pretty much sullied EA Black Box's reputation with the series. Undercover was released on the same platforms as ProStreet and it's the first NFS game on iOS, but it's also the last NFS title on PS2 and sixth-gen consoles in general. After the failures that were ProStreet and Undercover, EA put Black Box on the sidelines and brought in several developers to make games for the series. The series lost a consistent identity during this era, save for a new speedometer-inspired franchise logo and typeface that Undercover introduced and the debut of the Autolog networking system in 2010's Hot Pursuit. 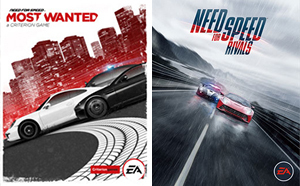 Two differently-styled NFS games were released each year in this short time period, but a few of this era's games (namely the Shift sub-series and Hot Pursuit) did help return the franchise to critical acclaim. However, as the series' YMMV page will explain, the fanbase became pretty fractured during these years. Need for Speed: Shift (2009): Shift was a second crack at realistic racing, this time from Slightly Mad Studios (an independent development team composed of people who worked on GTR, GTR2, and GT Legends, a trio of well-received PC sim racers), with help from EA Black Box. Released on Windows, PS3, Xbox 360, PSP,* This version developed by EA Bright Light and several mobile platforms (including iOS, Android, Windows Mobile, Symbian, and MeeGo), Shift was much better received than Undercover. A Xbox 360-exclusive DLC pack marked Ferrari's only appearance in any of the second and third era games until the make's full return in 2013's Rivals. Need for Speed: Nitro (2009): An arcade-like racer for the Wii and DS, with highly-stylized cartoonish graphics. The Wii version was developed by EA Montreal while the DS version was made by Firebrand Games. This game takes place in five exotic real-world cities: Rio de Janeiro, Cairo, Madrid, Singapore, and Dubai, with each city having a top racer and three tiers of cars. The DS version of the game also includes San Diego, but lacks top racers. Need for Speed: Nitro-X (2010): A DSiWare version of the original DS game. Need for Speed: World (2010—2015): Another attempt by EA at a racing MMO, this NFS computer game was free-to-play, featuring microtransactions for the "premium" version of in-game currency. It featured the cities of Most Wanted 2005 and Carbon (Rockport and Palmont, which may have been also connected to the Tri-City Bay from Undercover via a toll road that was never expanded upon) in a persistent MMO environment, not unlike Test Drive Unlimited. Developed by EA Black Box (later rebranded as Quicklime Games) and EA Singapore, it received middle-of-the-road reviews. Players started off with $35,000 to buy a starter car and begin racing against other players and the game's AI. Borrowing from the leveling mechanics found in Hot Pursuit 2010, players earned money and reputation for winning, which was used to buy upgrades in the form of aftermarket parts to adjust their stats. As players leveled up, they unlocked new tiers of cars and events you can participate in. Other features included Pursuit Outrun, where players tried to outrun the local police, Team Escape, where players and their teams had to beat the clock to avoid getting arrested, and Drag, based off the classic Underground/Most Wanted 2005 Drag events. After Quicklime Games' demise in 2013, EAsy Studios took over, but very few major developments were made to the game since. A group in EA Canada supposedly gained control of World from EAsy Studios, but EA later shut the game down on July 14, 2015 along with Battlefield Heroes, Battlefield Play4Free, and FIFA World. Need for Speed: Hot Pursuit (2010): The first game in the series developed by Criterion Games,* With some help by EA DICE, the makers of Battlefield and Mirror's Edge. the EA studio behind the Burnout franchise, is a Spiritual Successor to Hot Pursuit 2 and features some online-focused "race and chase" gameplay, either through multiplayer or the then-new "Autolog" system that continuously compares your best times to those of your friends and challenges you to beat your friends' times. It takes place in a not-exactly-open-world environmentnote There is an optional single-player-only free roam feature in the game that has practically nothing to do but drive. The career mode's events are selected via a map menu. called Seacrest County. Released on Windows, PS3, Xbox 360, and several mobile platforms (including webOS, Java ME, and of course the big three mobile OSes: iOS, Android, and Windows Phone), this installment is often heralded by critics as the series' highest point. Need for Speed: Hot Pursuit (Wii, 2010): The Wii version of the game was developed by Exient Entertainment, and it is wildly different from the Criterion-developed versions. It takes place in four different real world locations and plays more like Nitro than the HD versions, but without most of the cartoon stylizations of Nitro. This version was mostly panned by the few critics who played it. Shift 2: Unleashed (2011): After the success of Need for Speed: Shift, it's not too surprising to learn that EA gave Slightly Mad Studios another go-around and green-lit Shift 2, this time without input from Black Box. Unusual lack of the series' name in the title aside (although fans still call it Need for Speed: Shift 2  Unleashed), the handling model is massively improved from the first Shift. Shift 2 was released on Windows, PS3, Xbox 360, and iOS. Need for Speed: The Run (2011): Featuring The Cannonball Run-style coast-to-coast Epic Race across the United States with a heavy emphasis on story, cinematic action, and incredible graphics from the Frostbite 2 engine. The plot's kind of Excuse-y, but just know that Sean Faris gets some advice from Christina Hendricks about a 3,000-mile race across the United States that he can use to win $25 million, enough to pay back a crime syndicate he had a bad run-in with. It was meant to be EA Black Box's redemption after losing control over the series post-Undercover, but with less than stellar reviews, it was not the case. The studio was shut down in April 2013. It was released on Windows, PS3, and Xbox 360. A mobile version was made for Java ME and iOS, but the latter version was canceled before release. Need for Speed: The Run (Nintendo 3DS and Wii, 2011): Interestingly, a version made for Nintendo platforms was also released, developed by Nitro DS makers Firebrand Games. It has an even bigger excuse for a plot than the other versions; in this one a down-on-his-luck stock car driver named Matt is led across the US by a mystery woman. More interestingly, the 3DS version has online capabilities, including Autolog with StreetPass support. The Wii version doesn't have online features, but it does have local multiplayer. Regardless, these versions are similar to Hot Pursuit 2010 in terms of gameplay. It was clear from The Run that EA Black Box would not be taking back back control of Need for Speed, and EA shifted development of the games to developers in Europe. With Autolog 2.0 by its side the franchise seemed to have returned to its roots; racing mostly exotic cars in scenic locations with the franchise's famed police car chases. However, the two games in this very short era, a reinterpreted Most Wanted by Criterion Games and Hot Pursuit 2010 Spiritual Successor Rivals by new series developer Ghost Games, received a massive fandom backlash (mainly from those who preferred the second era's tuner-styled games). In addition, a film was released in 2014 as the only totally new Need for Speed-related thing that year (its twentieth anniversary no less), as EA and Ghost Games decided to reevaluate how they were going to handle NFS in the future. Need for Speed: Most Wanted  A Criterion Game (2012):note That subtitle is what it says on the game's cover and its Metacritic entries. Its actual title is just Need for Speed: Most Wanted. Criterion's second game in the series, a reboot of 2005's Most Wanted. This reboot is much less like a sequel to the 2005 original and more like a sequel to Burnout Paradise, but with cops, real licensed cars, a pseudo-realistic handling model, and the Autolog system. Takes place in a locale called Fairhaven City, differing from the first Most Wanted's Rockport. It also marked the beginning of a new era for the series, as then-Criterion vice president Alex Ward has stated in an interview, "It's not going to be spread anymore across different companies. Different studios have had a crack at it - it's definitely a Criterion gig now." 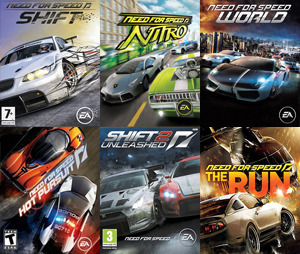 As the following year's Rivals proved however, Criterion would not hold onto the NFS franchise. It was released for Windows, PlayStation 3, Play Station Vita, and Xbox 360. The PS Vita received a few exclusive events for that version to make up for some necessary graphical drawbacks (though it never got any of the later DLC packs), the Xbox 360 (the only console other than PC to receive natively-developed versions of both Most Wanted games) received Kinect voice support in single-player, the PS3 had PlayStation Move support, and the PC version had 60 FPS support, the overall best graphics, and one other benefit mentioned below. Need for Speed: Most Wanted (iOS and Android, 2012): Developed by Firemonkeys Studios, a company formed from a merger between Firemintnote The makers of Real Racing and Flight Control and IronMonkey Studios,note Known for mobile versions of other EA titles, such as the praised mobile spin-off of Dead Space it is a version of Most Wanted 2012 for iOS and Android that, unlike the main versions, takes place in closed circuits around Fairhaven. It includes a few cars not found in the Criterion game, including the Audi R8 GT Coupe, the Hummer H1 Alpha, and even (initially before the release of NFS Heroes on the main versions) the BMW M3 GTR (E46) from Most Wanted 2005 as the #1 Most Wanted car.note Actually, it's the Lamborghini Aventador, but the Bimmer is given to players for free when they beat the #1 Most Wanted. Need for Speed: Most Wanted U (2013): The Wii U version of the game, which is graphically superior to the PlayStation 3 and Xbox 360 versions and contains a unique feature called Co-Driver, which allows a second player to join in using the Wii U GamePad to change many things in Fairhaven and enable dual controls, in case the person using the Wii Remote or Wii U Pro Controller is having trouble. The Ultimate Speed Pack is included in the game as standard and there are Nintendo-related Easter Eggs to be found. However, none of the later DLCnote Terminal Velocity (which adds Hughes International Airport to Fairhaven), Movie Legends, and Need for Speed Heroes were released for Most Wanted U and there is only a six-player limit in multiplayer compared to eight in the other console versions and twelve on the PC version. The release of this version of Most Wanted 2012 makes this game the first NFS game on any of the eighth-generation consoles. Need for Speed Rivals (2013): It is a Spiritual Successor to Hot Pursuit 2010 with elements of Most Wanted 2012 blended in while integrating single-player and multiplayer together, meaning you can play as a cop and stop other players' street races while co-operating with other cop players for example. Ferrari returns to the series once more since the content pack from Shift after four years. It is developed by new EA studio Ghost Games with assistance from Criterion Games and EA Vancouver. Rivals was a launch title for both the PlayStation 4 and Xbox One, and is one of the few games that runs natively in 1080p at 30 frames per second on both consoles, although it was also released for Windows (as per the norm), PlayStation 3, and Xbox 360, with Kinect voice support again on the Xbox platforms. The game also has a web-based companion app called the Need for Speed Network, where racers and cops can track their progress, their Autolog records between them and their friends, and best of all, help or screw other drivers using OverWatch. With this game, Need for Speed made yet another developer shift , and Ghost Games are now the new developers for the franchise. The Xbox One version of the game is available in EA Access's Vault, while the PC version is available on the equivalent Origin Access. Need for Speed Rivals: Complete Edition (2014): A rerelease of the game with all its DLC packs packed-in: Ferrari Edition Special Complete Pack, Simply Jaguar Complete Pack, Concept Lamborghini Complete Pack, the Koenigsegg One:1 (which was released for free in the standard version), Complete Movie Pack, and the Loaded Garage Pack.note Which includes the Ultimate Cop Pack, Ultimate Racer Pack (exclusive to PC and Xbox platforms), Premium Livery Pack, Classic Muscle Livery, Track Day Livery, VIP Matte Kit Livery, and Digital Revolution Livery. This is really to make up for the lack of a new NFS title in 2014. Need for Speed (2014 film): A film adaptation of the franchise directed by Scott Waugh (of Act of Valor fame) and starring Aaron Paul (of Breaking Bad fame) that was released in March 2014. Got mostly bad reviews from critics and didn't do great in the North American box office, but did well internationally. After seeing the complaints from fans of the Underground games, Most Wanted 2005 and Carbon, it's clear that EA has decided look back to the games that brought them the franchise's greatest success. EA also brought back the Undercover-introduced typeface, but made some small changes (the most noticeable change being the design of the "N" in Need now looking like a capital N and the odd decision to drop the "N" logo in the 2015 reboot). Need for Speed: No Limits (2015 — present): EA is calling on Firemonkeys again, this time to develop the first-ever original Need for Speed title for mobile platforms (that is, iOS and Android). No Limits began the return to a tuner focus in the franchise again after a little over half a decade of being rejected. Taking place in the city of Blackridge (and, in a 2016 update, Novato Bay), you race in various quick (as in usually less than a minute long) events to become the best driver in Blackridge's underground racing scene. This second free-to-play Need for Speed game was first released in Taiwan and the Netherlands in January and February 2015, then was later internationally released on September 30 later that year. Fun fact: No Limits, along with The Run, was one of many domain names registered under the Need for Speed name by EA back in 2010. Need for Speed (2015): Ghost Games took two years to develop this subtitle-free installment, released for PlayStation 4 and Xbox One in November 2015, and Windows in March 2016. The new game is a total series reboot that is mostly based on the first four second-era games, but contains elements found throughout the entire franchise. This includes extensive vehicle customization (debuted in Underground, although the performance-related aspects of vehicle customization were found in earlier games), an open world (Underground 2 started this), police chases (the series' staple, but it did make its open world debut in 2005's Most Wanted), and crew-forming (Carbon had this), all combined with the social gameplay that 2010's Hot Pursuit introduced with Autolog and were expanded on in later entries such the 2012 Most Wanted and Rivals. The city in this game is called Ventura Bay. 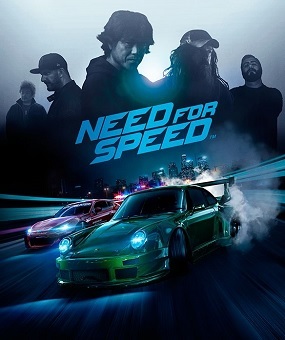 Oh, and live-action cutscenes are back as well, with actual professional drivers appearing in the game including (as shown left-to-right on the cover) ◊ Shinichi Morohoshi (Outlaw Icon), Ken Block (Style Icon), Akira Nakai (Build Icon), Magnus Walker (Speed Icon), and Chicago-based driving crew Risky Devil (Crew Icon, represented by Richard "Fish" Fisher on the cover). The game requires a constant Internet connection, not differently from the early builds of SimCity (2013), but Ghost provided several free updates through a program they've called the "Living Game" to make up for it. Need for Speed Payback (2017): Ghost's new title takes cues from the feedback received in the 2015 reboot. It will be more story-driven, with the player character and his crew having to take revenge on the House, a drug cartel that dominates Fortune Valley and its casinos, criminals and cops. One of the first things that has been announced for the game? It can be played offline. Need for Speed: Edge (TBD): Being developed by EA Spearhead and published by Nexon. It was first teased by Nexon in a press release on July 1, 2015, and a teaser trailer was published on November 3 the same year. It will be a South Korea-exclusive MMO based on Rivals where players race against others with power-ups scattered along the routes to improve their car. Need for Speed: V-Rally (1997) and Need for Speed: V-Rally II (1999): The American market branding of V-Rally, an unrelated rally racing title made by the French developer Eden Studios and published overseas by Infogrames. V-Rally 3 would be published without the NFS branding in 2002. Eden Studios would also develop the PlayStation version of Porsche Unleashed and the very old-school-NFS-like Test Drive Unlimited games. Beetle Adventure Racing/HSV Adventure Racing (1999): A racing game developed for the Nintendo 64 by Paradigm Entertainment exclusively featuring the Volkswagen New Beetle. Although the game does not have Need For Speed in its title, hidden game files suggest that Beetle Adventure Racing may have originally been planned as an NFS game. Its title in Australia was HSV Adventure Racing, and featured the Holden Commodore HSV in place of the Beetle. Motor City Online (2001—2004): An attempt at a driving MMOG, developed in-house by EA, and first game not developed by EA Canada. This game focused entirely on American cars, particularly muscle cars, from The '30s through The '70s (until the very end, when the Toyota Supra and the Mitsubishi Eclipse were added, presumably to broaden appeal). Despite not having the NFS branding, it was considered to be a NFS game by EA and fans of the series, and was even originally planned as Need for Speed: Motor City. It was largely unsuccessful, and was shut down in 2004.